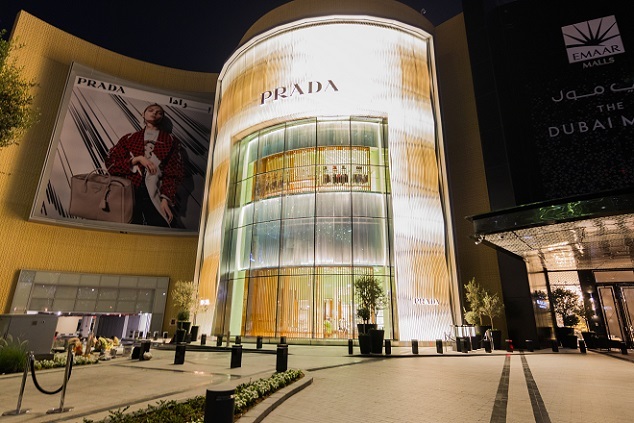 Prada inaugurates a new flagship store in Dubai at The Dubai Mall's Fashion Avenue, the extension dedicated to the most prestigious and select luxury brands, characterised by a unique and original visual identity as well as exclusive furnishings. The space, one of the brand's most important stores in the Middle East, spans three levels for a total surface area of nearly 1,550 square metres and houses the collections of clothing, bags, accessories and footwear for women and for men. The external façade – a tribute to the French-Venezuelan artist Carlos Cruz-Diez is a kinetic work of art composed of imposing gold and silver metallic blades. The large window framed by the front presents a ‘brise soleil’ of wooden slats that like giant partitions create an original dimensional effect with the sales area. Inside the mall, a Verde Aver marble façade ties the store's three floors together, while the display windows offer a first glance of the refined and elegant atmosphere. Spaces characterised by intimacy and richness with surfaces decorated in bas-reliefs and motifs inspired by the brand's iconic prints, emphasizing the precious aesthetic of the interiors. 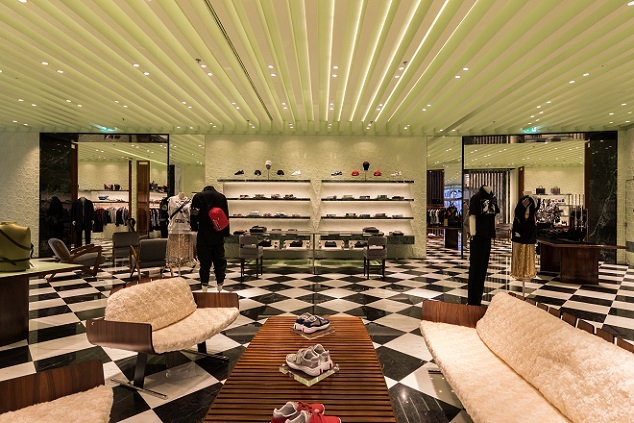 Of note is the design of the ceiling beams, one of the key elements of the new Prada concept, is reinterpreted here drawing inspiration from the great public architecture of the 1950s in Italy. 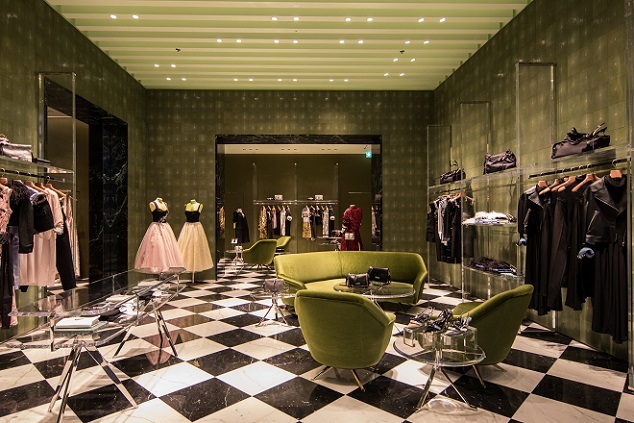 The black and white checkerboard marble floor is an allusion to Prada's origins and to the historic store in Galleria Vittorio Emanuele II, Milan. Even the display elements emblematic of Prada are enriched by new furnishings with details in coloured marble and polished wood, and by pieces designed by seminal Italian designers from the 1950s, both in their original versions and reproduced exclusively for Prada. Among these, the chairs by Osvaldo Borsani in green velvet, the Montecatini chairs by Giò Ponti in wood and straw by Vienna, re-editions for Prada, and an original table in marble and brass by Giò Ponti. 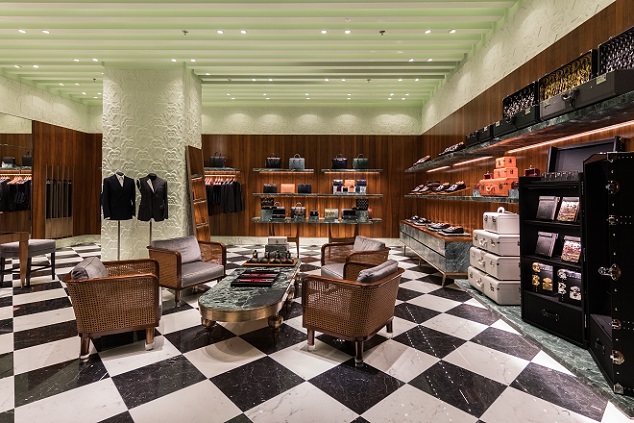 The ground floor is dedicated to women's leather goods and footwear while the mezzanine, where the most intimate and private area of the store can be found, houses women's clothing, the Made to Order service and an exclusive collection of eveningwear. In this space the biggest rooms present leather-lined walls in shades of green, while other rooms are covered in green silk fabric or feature a floral motif on a silk jacquard fabric. 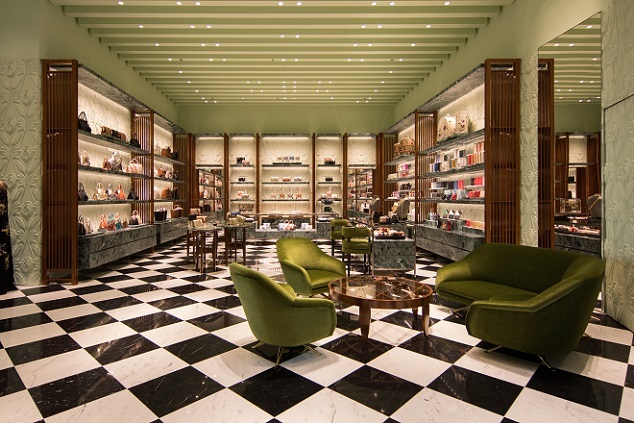 The top floor is dedicated to the leather goods, footwear and clothing collections for men, to Made to Measure, Made to Order and fine leather goods, in a space characterised by boiserie interspersed with green marble shelves, completed by chairs by Giò Ponti, exclusive re-editions for Prada. The principal space, which houses a special selection of lifestyle products for women and men, is characterised by a large window that overlooks the city and by big colourful tables and wooden sofas by the Brazilian designer Jorge Zalszupin with faux fur cushions, transmitting a playful and casual atmosphere.